We are pleased to announce two exciting shows this summer! First, we are performing all over at the Southeast Credit Union Conference & Expo in beautiful Orlando, Florida on June 11, 2014. 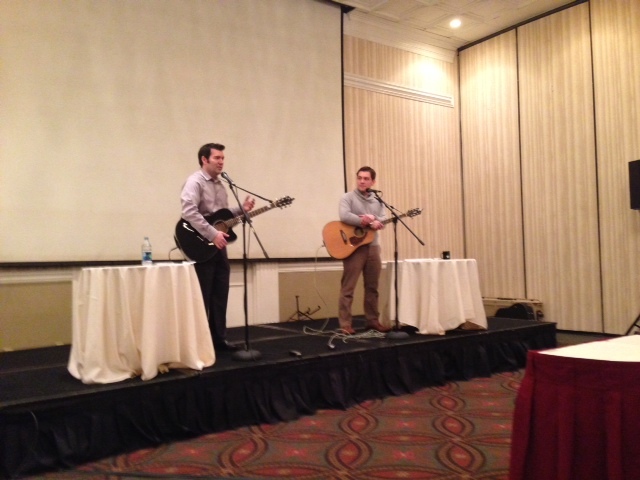 We’ll be performing our musical breakout session, “Credit Unions Rock! Getting in Tune with our Roots and Philosophy,” performing a set of songs in the exhibit hall, as well as playing a special kids show in the evening. It’s shaping up to be a great event and the theme of the conference is “Living the Cooperative Principles the Credit Union Way” so it’s definitely a perfect fit for us! 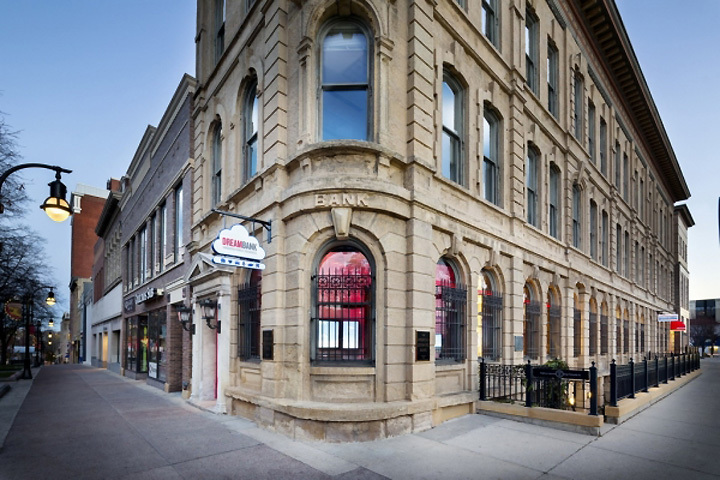 In July, we are honored to be performing a set of live music for the Filene Research Institute’s 25th Anniversary Shindig in Madison, Wisconsin on July 15, 2014. Expect to hear some of our original songs, mixed in with some popular covers and some DJing of our favorite tunes. Hope to see you at either event this summer! And of course, if you are ever interested in having The Disclosures perform at your next event, here is more information. 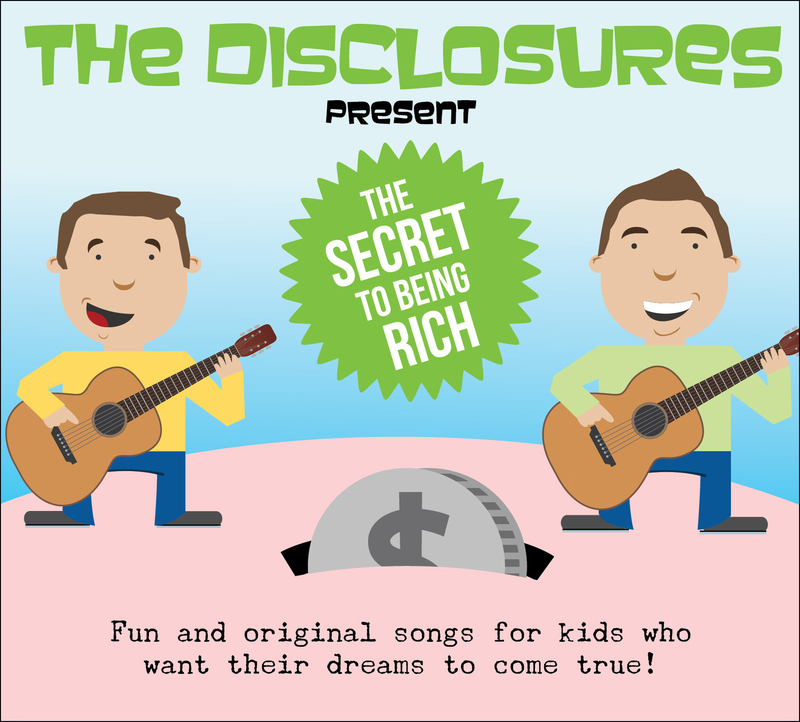 Kicking off National Financial Literacy Month, The Disclosures – the Madison-based “musicians with a mission” – have released a new video and free song download for “The Secret to Being Rich”, which is the title track off of their recently released financial education album for kids. While other songs on their new album focus on financial literacy, the song “The Secret to Being Rich” is intended to teach kids that being ‘rich’ takes hard work and discipline, but that you can also be wealthy in many ways aside from how much money is in your wallet. “This is one of our more serious songs for kids, but we think it’s also one of our best because it contains a message that gets lost in a lot of financial literacy instruction – that money is important, but it’s not everything,” said Christopher Morris, Disclosures band member. The Disclosures recently took their youth financial education songs on tour in Texas, playing live shows and assemblies for more than 1,000 K-5 students. Click here for a tour diary with pictures, videos and more. 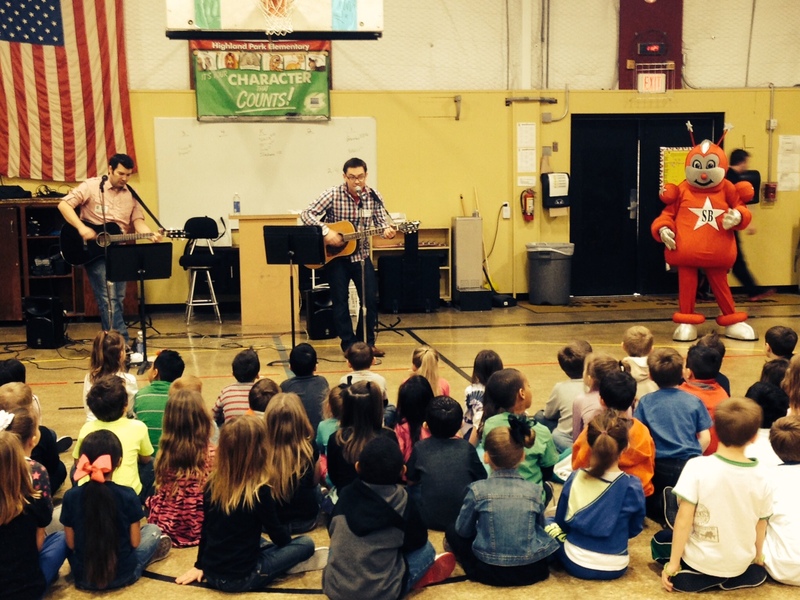 Our shows featured many of our financial education songs, as well as some fun discussion with students about savings and being careful with money. 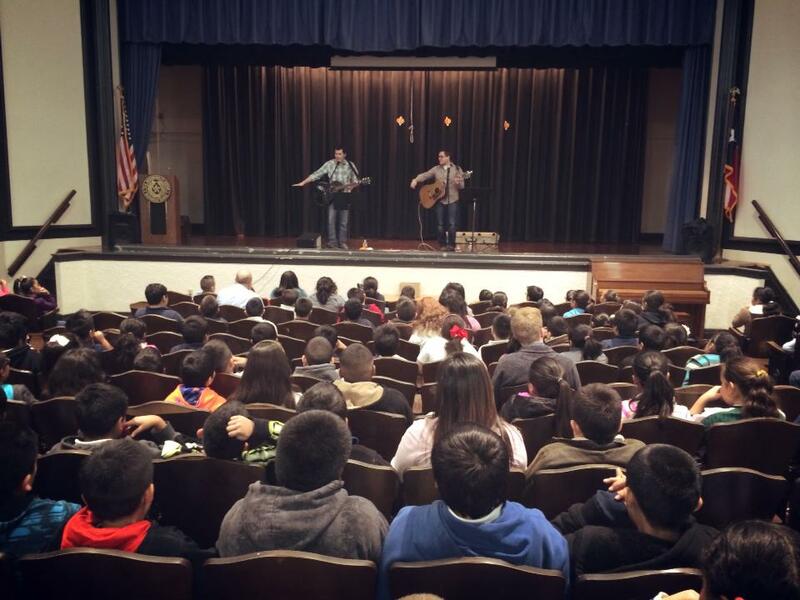 We played for over 1,000 students on the tour and while it’s hard to condense all of the awesome things that happened into one blog post, here’s our attempt at doing so! The first day of the tour was a busy one, with a total of four shows lined up throughout the day. 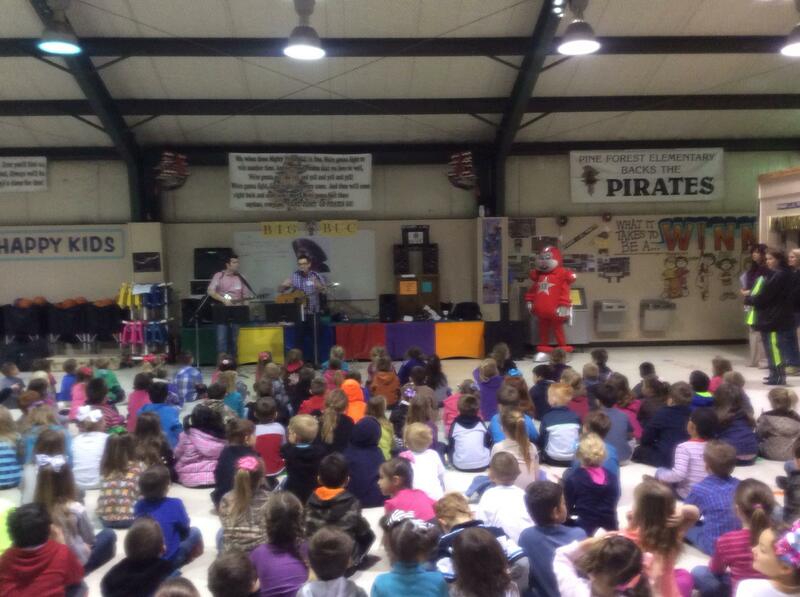 Two shows were for pre-K and 1st grade audiences and we played in school gymnasiums (one was even decked out in pirate flags since their school mascot was a pirate – perfect for our “Kidd Silver” song!). For the other two shows, we were fortunate to play in the very impressive Nederland School Performing Arts Center for large groups of 2nd and 3rd graders. At both shows for the older group, we were asked to play encores of “Thank my Piggy Bank” as the kids sang and screamed along with the chorus. Our “smash hit” with kids made us feel like The Beatles for a brief second! Afterwards, we took pictures with the students and so many of them were excited to talk about their piggy banks and what they were saving for. We wish we had more time to talk with them all, but encouraged them to keep up the great work and talk with their parents, credit union and teachers about how to make their savings dreams come true. After a flight to Ft. Worth, day 2 of the tour kicked off in a neat old school auditorium (pictured at the top of this post) where we played to a large crown of 3rd through 5th graders. This was followed by a fun Q & A session with the kids where we talked about more money tips, our musical backgrounds and how we are not, in fact, brothers. The second show venue probably had the most elaborate stage set as it was a elementary school cafeteria decorated for a Valentine’s Day assembly. 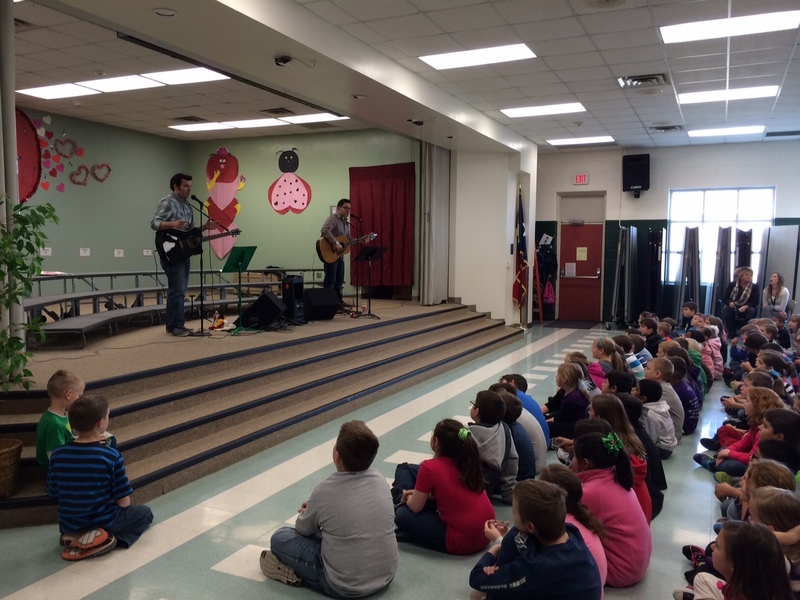 The school’s 3rd and 4th graders sat on the floor and had a great time singing and moving to our songs about money! Again, we were asked if we were brothers or cousins. Again, the answer was no. Both groups proved to be excited and very ambitious about their savings goals. When we asked them what they were saving up for, their answers included “a house”, “a car” and “money for college tuition” — impressive, right? We led the kids through a quick exercise to demonstrate the difference between wants and needs and encouraged them to keep their dreams big while also being realistic, which we hope was helpful for the few kids who said they needed a Ferrari or a mansion! The third and last day of the tour culminated with a performance at the Cornerstone Credit Union Foundation’s FOCUS Summit in Dallas. The conference is for financial education advocates (credit union professionals and others) and we got to kick it off with our interactive education session called “The Power of Song – Amping up Financial Education”. 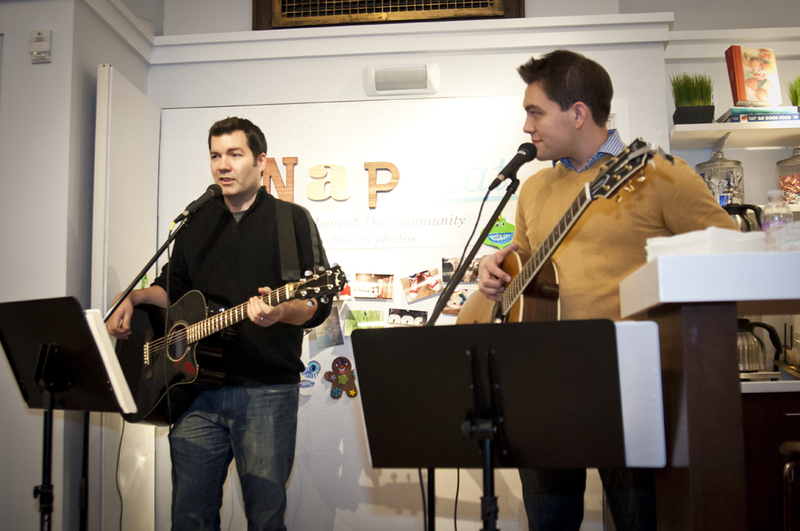 We played some of our new kids songs and shared insight on the creative process, experiential learning and the power of music and humor in education. It was also a lot of fun getting the adults to shout the infamous pirate “ARGH!” just like the kids had been doing the past two days (click here for a video snippet). Thanks again to FivePoint Credit Union and Tarrant County Credit Union for making this tour possible and taking good care of us (special thanks to Mandy and Tawna!). 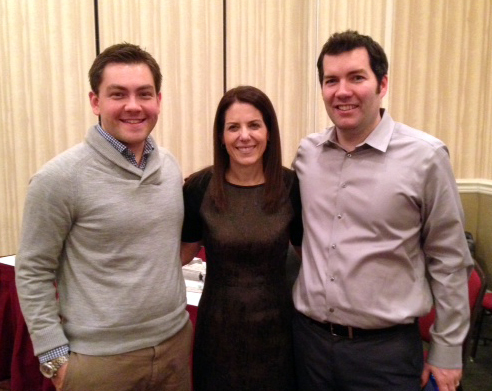 Also, big thanks to Courtney and the Cornerstone Credit Union Foundation for inviting us to their FOCUS Summit and let us “warm up” for Jean Chatzky! – Won’t You Be My Money Buddy? More pictures from the event can be viewed on our Facebook page. Thanks to friends and family who traversed the snowy conditions and took a break from the holiday bustle to celebrate with The Disclosures at their record release party last week. 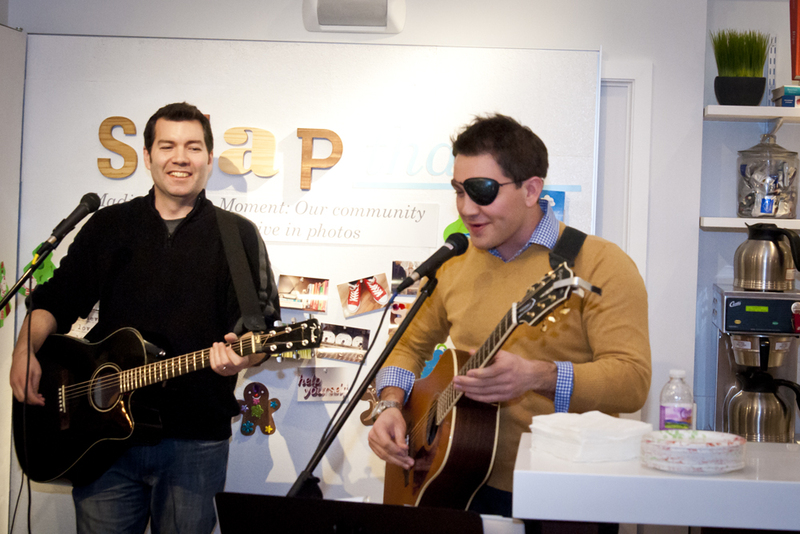 And a big thank you to DreamBank and their great staff for hosting the party. Hope you have a Happy New Year and we’ll see you in 2014! 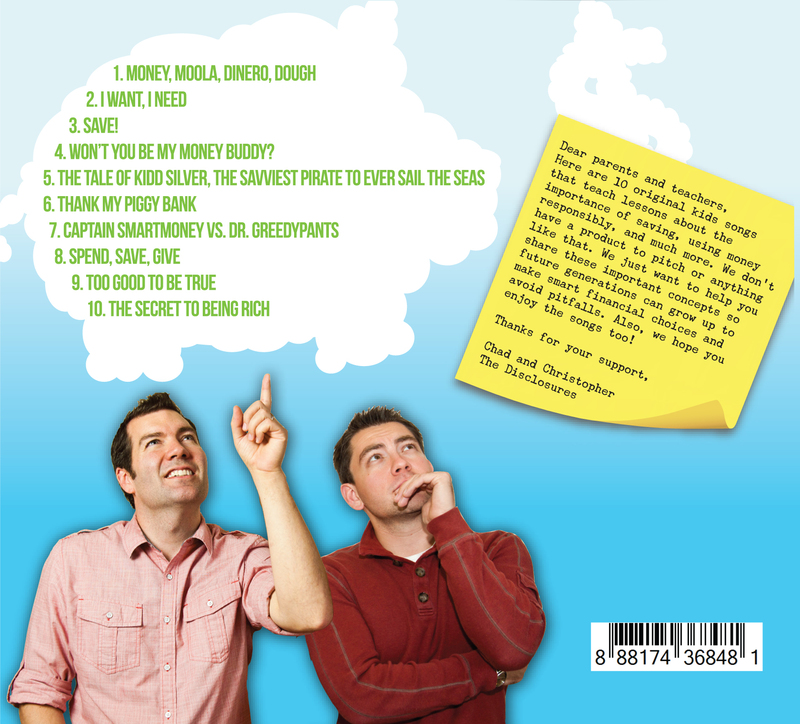 Two Madison musicians have released a financial education album for kids that introduces important money lessons through songs about pirates, superheroes and other non-sequiturs. The album, called “The Secret to Being Rich”, features ten original songs for ages 10 and under that incorporate core financial literacy concepts including saving, responsible spending, the importance of charity, dangers of “too good to be true” advertising and even the basics of how loans work. Furthermore, the album’s overall theme ties into its tongue-in-cheek title, which is meant to convey to kids that being ‘rich’ takes hard work and discipline, and that you can also be wealthy in friends, family and other things in life that can matter much more than the money in your wallet. All songs were written by Chad Helminak and Christopher Morris, who perform as band “The Disclosures” outside of their day jobs within the credit union industry. 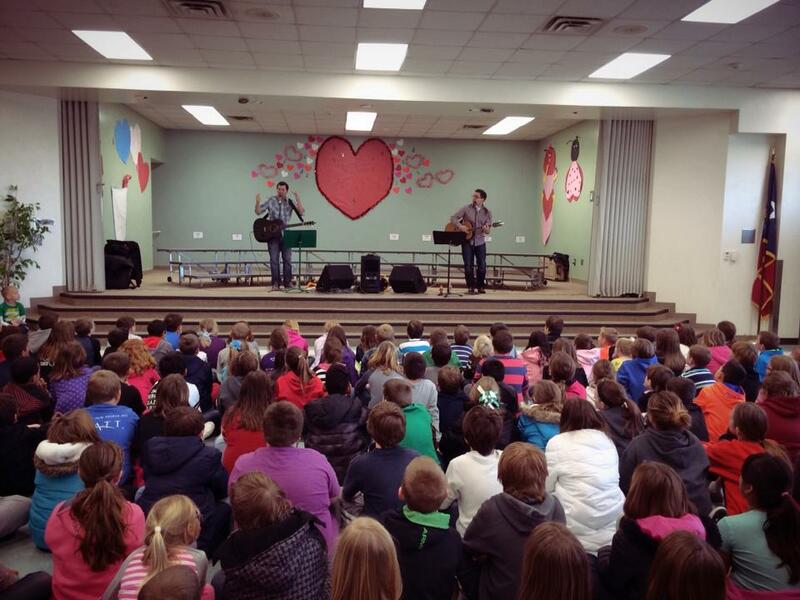 Morris and Helminak have also developed discussion topics for teachers and parents, as well as a classroom performance which they’ll be debuting in Texas elementary school tour in February, 2014. “The Secret to Being Rich” album is available for download on all major digital music stores such as iTunes, Amazon and others. Physical CDs also can be purchased at cdbaby.com, and The Disclosures will also be processing bulk orders of CDs at discount for purchase by financial institutions, schools or youth organizations. All ordering information and additional resources can be found on thedisclosuresmusic.com. Earlier this year, The Disclosures released “Thank My Piggy Bank,” the first single and video from the album. 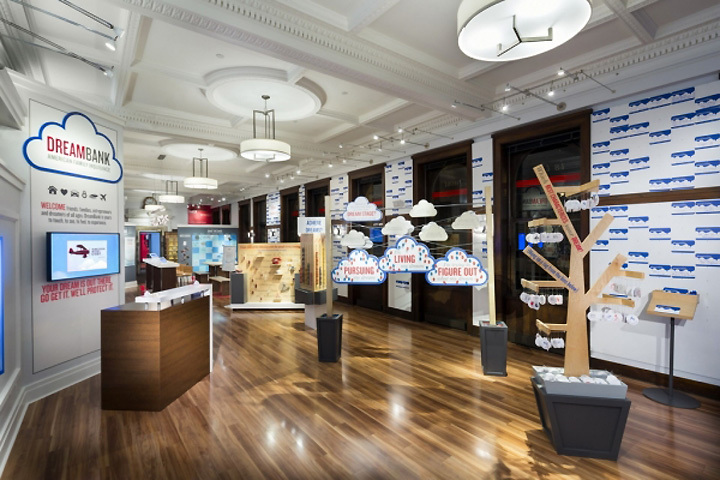 The video was filmed around town at the Madison Children’s Museum, Capitol Kids, and Summit Credit Union. A record release party is scheduled for December 20th at DreamBank in Madison. Details are online here. 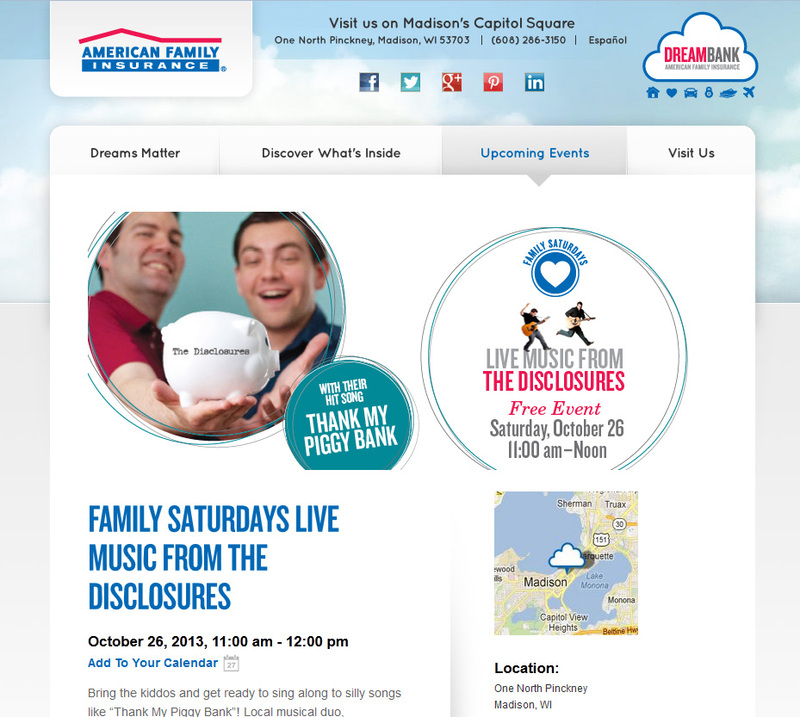 Come celebrate the release of The Disclosures’ new kids album, “The Secret to Being Rich,” at this fun and free event. This is your chance to meet and hear The Disclosures (Christopher Morris & Chad Helminak) – musicians with a mission – and also purchase first print copies of their new album. The album has 10 songs that use music and humor to introduce lessons about money, savings, responsible spending and more. Live acoustic performance at 6:30. All ages are welcome and encouraged to come! You can RSVP on Facebook here & hope to see you there! 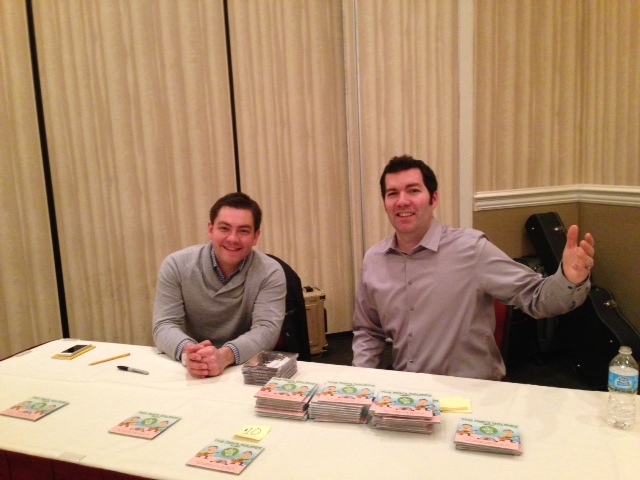 We’re happy to announce that our new kids album, “The Secret to Being Rich”, will be released worldwide on December 10, 2013. The album has 10 songs that use music and humor to introduce lessons about money, savings, responsible spending and more. It will be the first of its kind and available where ever you download music digitally (iTunes, Amazon, Napster, etc). We will also be selling physical copies of the album on CD at shows/events where we perform as well as online at stores such as CDbaby.com, Amazon and others. Above is the back cover of the CD (in case you missed it, here’s the cover art). Thanks again goes to Lesley Clark from Sissybird Design for creating all the artwork for our album. Also thanks to Morriss Partee/Squirrel Trench Audio for his fantastic work mixing and mastering on the album. Won’t You Be My Money Buddy? Look for more information coming soon on our record release party and other album-related news. We can’t wait to share our music with you! We are pleased to release the first glimpse of our album art for “The Secret to Being Rich” slated to release in December, 2013! The forthcoming kids album uses music and humor to introduce lessons about money, savings and responsible spending. We owe a huge thanks to Lesley Clark from Sissybird Design for putting together this wonderful front cover. She’s working on all of the album art for us and every bit of it looks amazing. Thanks Lesley! What’s the album going to sound like? In case you missed it, on April 2nd, we released the song and video for “Thank My Piggy Bank”, the first single from the album. Stay tuned for the tracklisting and more details on our album between now and December. We can’t wait to share it with you! The Disclosures were lucky enough to be included in the special issue and are honored to be recognized. We are in such great company as the issue is bursting with stories of amazing people from across the movement! We can’t say this enough too – a huge THANK YOU to our employers, colleagues, family, friends and fans for your support and encouragement. You guys rock! Hope to see you at either of those events!